First, please plan to come for a Town Hall Conversation to address your questions on Sunday, April 22 at 6:00 PM in the Gym. 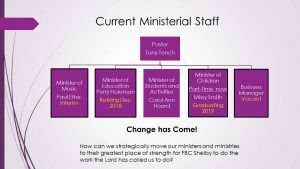 Now, let me say, thank you, FBC Church Family, for your prayers as you have heard me describe a proposal for our ministerial staffing. This proposal has been discussed and refined and prayed over by the Job Search Super Committee of the Personnel Committee, the Future Story Steering Committee and the Board of Deacons. At every juncture in the discussions, there has been great discussion and, in the end, great unanimity. At each phase of deliberation it was our belief that we go to the church unified on the proposal so that our church family can be in the best possible position to make a decision. Now, we call on our church family to pray over this concept, bring your questions and insights to the conversation, and depend upon the Holy Spirit to guide us as we weigh the impact of the transition plan we have described. God will bless our discussion as we trust him to lead us whatever the outcome will be. With two current vacancies and a retirement by the end of the year, we are at a critical time of decision. In his book, Transition Plan: 7 Secrets Every Leader Needs to Know, Bob Russell has said it well: “(1) We are all going to die and, by extension, all ministry tenures come to an end; (2) We lose energy and imagination as we age; and (3) Older leaders lose ability to inspire younger people.” The staffing proposal that is before us is not about anyone “stepping down” – that kind of language is not appropriate for a Christian ministry team that is committed to Jesus as its head. Rather, this is a “stepping forward” into new ministry roles for the sake of the ministry effectiveness of our church in the 21st century. In other words, as I have said to the aforementioned groups, “At the age of 58 years I have several years left before I can retire. BUT, I am not content to wait through those years in diminished-capacity-leadership-mode. I am not content to wait on our church to become energized to reach the 30,000 around us to whom we are to carry the gospel. I don’t want the church to just be waiting on another day. The truth is the day will come when I am not the Pastor so let’s plan for it now. It is certainly not inevitable that older leaders lose ability to inspire but it happens, let’s not wait to see it happen.” Instead, I am proposing that we strategically plan for our ministry staffing by prayerfully considering the possibilities of this proposal at this opportune time in the life of our church. Thank you for praying for our ministers and our church family as we discuss this staffing proposal and as we follow God’s lead in deciding whether to press on in its implementation. I thank God for you all, dear FBC Church Family. I want the best for our ministry future because the mission to which we have been called is critical! Please join us for a Town Hall Conversation to address your questions on Sunday, April 22 at 6:00 PM in the Gym.